3" x 4", 3" x 6", 3" x 8"
Flameless candles are fast becoming the preferred choice for many individuals, couples and business owners allowing them to recreate classic styles without all the hassles and frustrations of typical candles. Flameless candles are a surprising, safe alternative to traditional candles, perfect for parties, weddings, and special events, as well as marvelous gifts for holidays and other memorable occasions. Choose which styles compliment your event. Lighting candles, especially when you’re dealing with a venue or church full of hundreds of luminaries, can take a lot of time and energy. Spare lighters and matches must always be available and breezy areas could require relighting of some candles, not to mention the fire hazards and potentially message clean up situations that can arise because of burning wicks and wax melt. Perfect for a wedding or special event, especially when your venue will not allow an open flame. 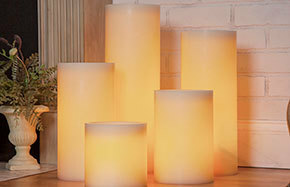 Battery operated candles or LED candles come in bulk in many different shapes and sizes, and simulate a real wax candle. 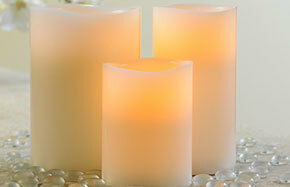 Our flameless candles offer you the same charming glow without those irritating side effects. This collection of high quality products will brighten your venue and keep your stress at healthy levels. Each is designed to be used multiple times so you get more burn time for your buck. 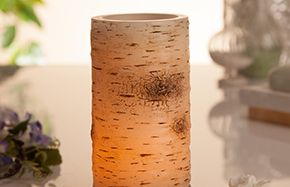 Simply add the batteries to the candle and watch as a dainty LED light tucked inside begins to glow. When the light fades or goes out, replace the battery and you are ready to go again! No messy wax and no open flame necessary. 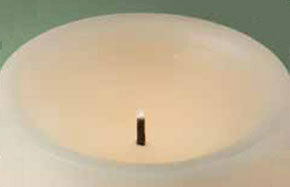 Your flameless candles can be placed anywhere that a real candle normally sits. 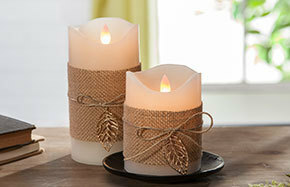 Add them to candelabrum or candle holders. You can even set them on top of items or furniture that you wouldn’t normally place the real thing. Our website offers a large selection of handsome LED-lit alternatives that will build atmosphere in any setting. Most products come in ivory or white. Please see the individual product page for color availability. Each is cylinder shaped with a smooth, softly textured exterior that looks remarkably similar to genuine wax. Our models include perfectly even rims that look like pristine, unused candles as well as those that are designed to appear as though they have already begun to melt. Some even feature raised drip marks that trail down each side for added detail. 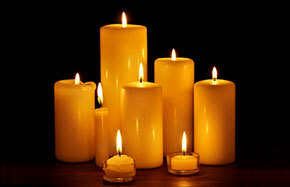 We can help you find a flameless candle in almost any size. 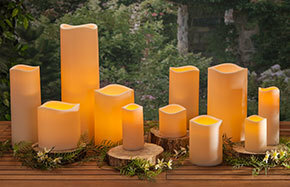 Our products include functional floating tealights and standard votives as well as tapers and pillars that range from 6” to 12” tall. You can also explore our list of packages, which feature multiple sets of varying sizes or our faux wax candle set with recharger base. 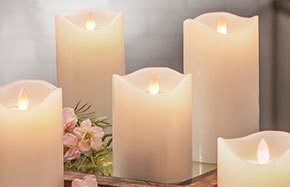 Before submitting your order, don’t forget to find out what power source is needed for your candles. You can find long lasting CR2032 batteries that are compatible with many of our products. Purchase everything together so you can save money and enjoy the convenience of everything you need arriving in one package. 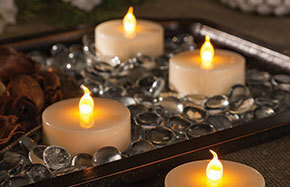 Begin shopping today to discover how we can give you the luxury of candle light without the smoke, fire and melted wax! By Pam from Golden, CO on February 23, 2011. I ordered these for a retirement luncheon and had my student worker add a ribbon around each one. They made the tables look really nice and I like how the candles look like they were real burning candles. The delivery was prompt and out of all the candles I ordered, one did not work and they reimbursed me immediately and without question. By Ethereal Bride from Portland, OR on January 11, 2012. By Sherry from Liberty, TX on January 13, 2012. Used the candles in windows of a wedding reception; bride wanted ambiance of candles, candles not allowed, this product fit the bill perfectly! Great product, awesome price! - 5 stars By Mom from Traverse City, MI on July 20, 2012. Exactly what we were looking for, candles are true to size. The perfect flame & flicker. Very Impressed! - 5 stars By Wedding Fever! from Blackwood, NJ on July 24, 2012. As the Maid of Honor and wedding planner(and financer) for my sister's Halloween themed wedding, I bought these for ambience at the reception. Not only did they come very quickly, but I was seriously impressed with the quality! They look so realistic, and are actually made of heavy duty wax! The flame "flickers" like a real candle. I can't believe how inexpensive these were, too. They are so pretty that I will be reusing these for my own wedding next year! Thanks Wholesale Event Solutions! I had never heard of you before, but I will definitely be using you again!